Enhance your handling performance and increase traction with a BMR Suspension Level I Rear Control Arm kit. Designed for 2005-14 Mustang models, this kit includes Lower Control Arms and Upper Control Arms for a basic rear end traction upgrade. Launching harder, reducing wheel hop, and adding cornering consistency to your 2005-2014 Mustang is easy with lower control arms from BMR Suspension. The OEM stamped steel control arms with soft rubber bushings deflect under load, causing them to absorb power rather than transfer it to the tires. 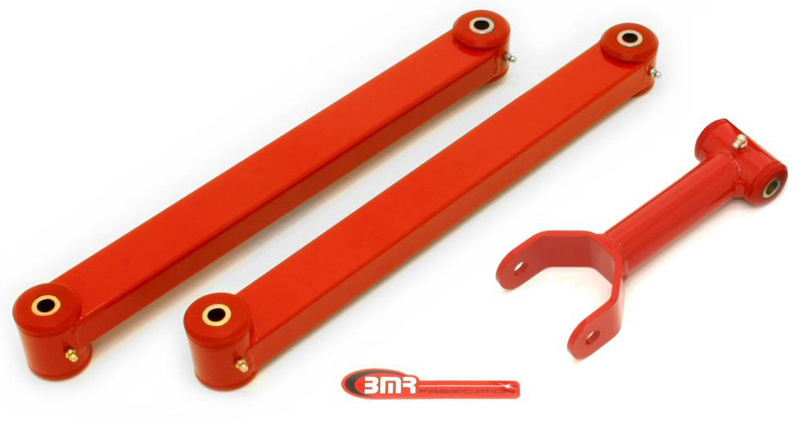 BMR’s polyurethane, non-adjustable tubular control arms for S197 Mustangs are TIG-welded using heavy-duty 1x2-inch boxed steel tubing, creating a strong control arm that greatly improves performance. The stock control arms flex under cornering loads, giving you inconsistent handling characteristics, creating an unpredictable car on the track. The flexible OE control arms, coupled with soft bushings that have massive amounts of deflection, and you’re left with poor handling performance. Featuring Greasable, 95-durometer bushings, these offer a solid, more responsive feel than the stock rubber bushings, BMR Suspension designed their Rear Control Arms for street performance, drag race and road race applications. The BMR part's heavy-duty construction eliminates control arm flex, giving you much improved repeatability on the street, starting line, or in the corners. BMR’s polyurethane bushings are designed to be compliant enough to give you a comfortable ride and absorb NVH, while remaining firm enough to stand up to high loads of any performance environment. The bushings easily handle the high compression loads of hard launches and hard acceleration, yet offer plenty of articulation for great handling. These are the perfect upgrade for the enthusiast looking to improve performance at an affordable price, while maintaining acceptable NVH levels and ride quality. The single upper control arm is responsible for maintaining pinion angle and preventing axle counter-rotation - this "3 link" style suspension is ideal for autocross and road race applications as it allows the most articulation possible with a solid axle. For drag racing, however, the single, centered link becomes a weak point as the arm is only one inch thick in the middle and made from light gauge, stamped steel. Our upper control arm is made from 1 5/8" .120 wall DOM tube and is MIG welded.